There are countless ways to enjoy pizza. Some people swear by an authentic New York slice. Others crave Chicago-style deep dish. It’s hard to please everyone at a pizza restaurant. Fortunately, Arizona has some standout restaurants that do just that. Here are the 10 best pizza restaurants in Arizona. Pizzeria Bianco has quite the buzz. 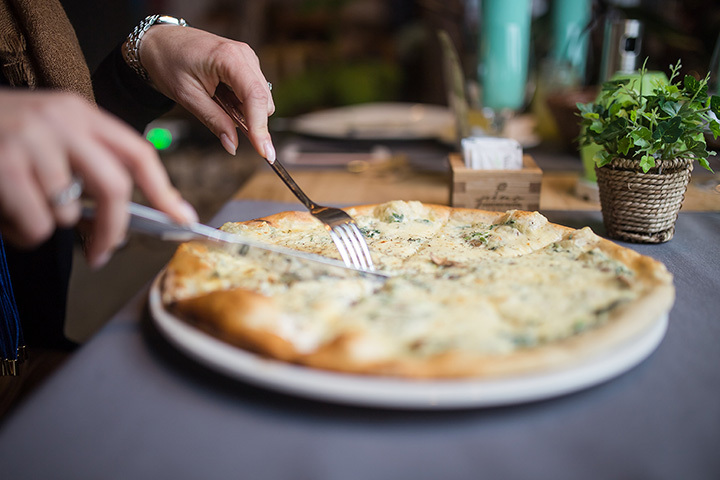 Since opening in 1988, this pizzeria has gained national recognition and a huge following. Chef Chris Bianco has won numerous awards, including the prestigious James Beard Foundation Award for the best Southwest chef in 2003. It’s not unusual to see long lines and wait times of four hours at this restaurant on a given night. Pizzeria Bianco is one of the rare examples of something living up to the hype. Located in Heritage Square, this small, homey pizza joint serves wood-fired Neapolitan pizzas. Their artisanal pizzas are flavorful, filling and delicious. Locals rave about the perfectly crafted margherita pizza and meat lovers swoon for the wise guy—a blend of onion, smoked mozzarella, and fennel sausage toppings. It’s hard to determine the best part about Cibo. First, there’s the ambiance. It’s located in a restored 1913 bungalow complete with an outdoor patio, twinkling lights, and a large fireplace. Then there’s the location in the heart of downtown Phoenix. Last, but certainly not least, is the food. Cibo serves creative Neapolitan pizza to go with their Italian menu. Their signature pizzas include bold ingredients like artichokes, Prosciutto, ricotta, and arugula. Make sure you leave room for dessert. Their Nutella Crepe with strawberries and chocolate makes for the perfect nightcap after a big meal. Phoenix natives might get déjà vu at the Parlor. That’s because it’s located in the old Salon De Venus building that housed a parlor for six decades. After an extensive renovation, the building became home to a new kind of hangout. The Parlor is a modern pizzeria with tasty wood-fired pizzas. All their food is handmade daily and many of the vegetable served are grown at local gardens. This pizza joint is best for the adventurous eater as they blend offbeat ingredients to make signature pizzas. The best of their pizzas is the funghi. Don’t let the name deter you. It’s a delicious pizza topped with roasted mushrooms, goat cheese, truffle oil, and chive. Social media has spoken, and they’ve deemed Casanova Brothers Pizza king. Both BuzzFeed and Yelp recently voted Casanova Brothers as the best pizza place in Arizona. Owned and operated by two brothers, this pizzeria has been service Valley residents New York style pizza since 2008. They specialize in Neapolitan, Sicilian, white pizza and calzones. You can grab a New York slice or go for one of their specialty pizzas. The staff favorite is the New York Special. It’s layered with bacon and jalapenos and topped with ham, pepperoni, and sausage. La Grande Orange is more than just a pizzeria. It’s also a grocery store, gift shop, and bar. There aren’t many places where you can shop around for some wine, cheese, and houseware while you wait to be seated. Still, La Grande Orange is all about good pizza. Their pizzas are inventive, fresh, and affordable. Crowd favorites include the avocado pizza, mushroom party, and the vegetarian daily farmers market pizza. La Grande also caters to many diet restrictions. The vegan, vegetarian, and gluten-free options are the best in town. Deep dish pizza lovers will be at home at Rocco’s Little Chicago. Rocco’s serves authentic Chicago-style pizza to the Tucson community. Their buttery deep dish crust pairs well with massive pizzas like the fungus humungous, great Chicago fire, and the angry Samoan. Their best pizza, however, is the kitchen sink. It’s topped with pepperoni, sausage, green peppers, mushrooms, and onions. Though they’re known for their deep dish, Rocco’s also serves thin crust and draws large crowds every Wednesday for 50-cent wing night. Though still in its infancy, Lou Malnati’s has taken the Valley by storm. This Chicago based restaurant burst onto the scene last year. Though Lou Malnati’s has been a Chicago staple for over 45 years, they had to earn a completely new fan base in Phoenix. So far, that’s not been a challenge. Lou Malnati’s is constantly packed to the brim with hungry patrons looking for deep dish goodness. Lou Malnati’s makes their pizzas with fresh Wisconsin mozzarella and vine-ripened tomatoes to ensure maximum flavor. Whether you go for a thin crust or deep dish pie, you can’t go wrong with the Malnati Chicago classic. It’s made with lean sausage, extra cheese, and tomato sauce on their traditional butter crust. Pizzicletta is Flagstaff’s finest pizza restaurant. That’s because their brick oven pizzas are made with extra care. The pizza dough is naturally leavened for three days and their produce is organic and locally sourced. Their 900-degree brick oven ensures the pizzas come out fast and crispy. Pizzicletta’s Neapolitan-style pizzas are all either a rossa (tomato based) or a bianca (cheese based). For dessert, you can grab a pint of house-made gelato to go. Tourists flock to Pisa Lisa. This modern pizzeria is a favorite among Sedona’s visitors due to the wood-fired pies, patio, and desserts. Each pie is made with homemade tomato sauce and gluten-free ingredients. There are many artisan pizzas worth a taste but it’s hard to beat the au savage. It’s made the house sauce, provolone-mozzarella, picante peppers, sausage, prosciutto, coppa, and salami. Lisa makes every bite count whether you grab an appetizer, salad, pizza, or gelato for dessert. Vacation never tasted so good. Nothing pairs better than pizza and beer. At least that’s what 1702 believes. They have an ever-changing selection of 46 domestic and imported brews to go with their pizza. The self-proclaimed “beer and pizza mecca of Tucson,” 1702 is a favorite among college students and extra hungry locals. Their specialty slices are epic in size. One slice of the decadent Italia, meat, or buffalo chicken is enough to send you into a food coma. 1702 mixes good wings, salads, and sides to complete an already stacked menu for pizza lovers.